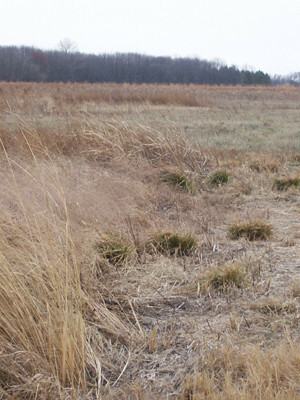 Hike and Sketch at Bartel Grasslands – Let's Paint Nature! I heard through the Illinois Birding List, that if you visit the Bartel Grasslands after 3pm, your chances of seeing a short-eared owl over the field this time of year is pretty high. Well, that’s all I needed! So yesterday I jumped in the car and headed out to the Bartel Grasslands for a hike. Bartel is huge and currently being restored by many hard working volunteers. 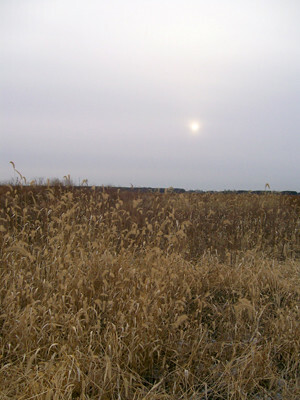 It’s beautiful and vast and on a day like this one (32°F with hazy sky), I was the only one there. Can you see a plot of pine trees in the background? Several sections of pine dot the landscape here and there. It is the perfect habitat for owls, pines on the edge of a field. Peering out over the grasslands, I see it! Movement! Silent movement! 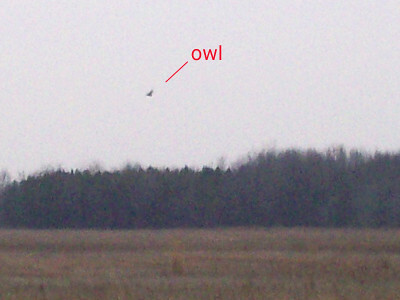 I grab my binoculars and sure enough, a short-eared owl. I watch as I try to control my shaky hands. He flies low, real low, back and forth in a pattern….searching. As he gets closer to me, he looks right at me. A circle of white surround his face, his eyes put me in a trance. He takes a lightning fast glance down at the ground and then back at me. Wow! I couldn’t talk if I wanted to, just frozen in awe. Behind him much further out I see 3 more flying above the field. They are so far, I can’t tell whether they are owls or northern harrier hawks. My fingers are numb and my view in the binoc is fogging up. It is well worth it, but I know it’s time to turn back and start my hike towards the car. 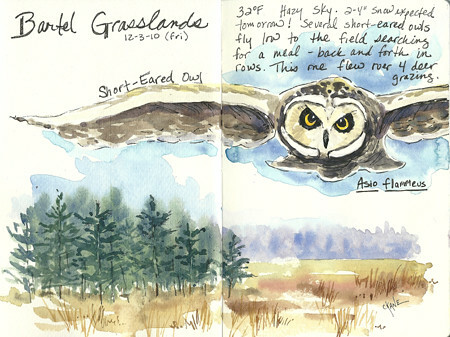 It was an amazing hike and my very first time spotting a short-eared owl. I will never forget this day. Speaking of hiking, make sure when you go out you are dressed for the weather, warm, with multiple layers, also remember to always stay hydrated. Check out the CamelBak Water Bottle! Neat find. Alan: What a neat childhood memory! Yes, I bet the owl scared you, would scare me too. Thanks for sharing! Loved your post and image of the SE Owl. Would like to talk with you sometime about your experiences at Bartel. Thank you very much and thanks for contacting me. I had the pleasure of meeting you a few times and learned a great deal. You are a very inspirational teacher of nature! 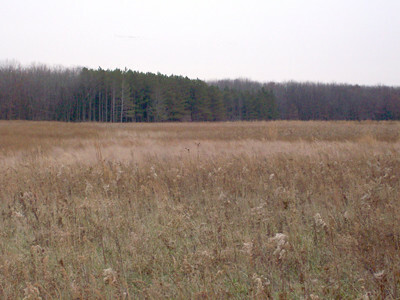 Few Long Eared Owls and Saw Whet’s for this year’s Thorn Creek Audubon Society Owl Walk on February 12, 20011. The snow is so deep you have to wear snow shoes to travel. BUT, the Short Eared Owls are present in good numbers, 9 on Thursday evening. From 5:00 p.m. until dark is the best time to see them hunting from the TCAS Viewing Berm. We have also had two female and one male Northern Harriers hunting each day. Thanks for the update! That’s some great info and specific times. If I would have looked at this earlier, I would have tried to make it out there last Saturday. Bummer. Well, next time for sure!